Desmarchais is one of three Quebec natives on the men’s junior squad in 2019. 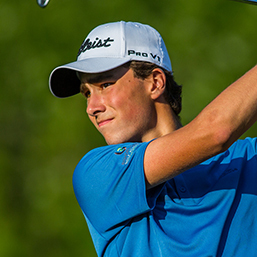 Hailing from Longueuil, Desmarchais joins the team after emerging victorious at the Future Links, driven by Acura Ontario Championship, the Quebec Junior Provincial Match-Up, the Quebec Junior Boys and the CCAA National Championship. Q: How did you get into golf? My dad introduced me when I was 3. I was hitting balls in the yard and that’s where my passion comes from. Q: How do you mark your golf ball? I trace a red line over the word Titleist to aim the ball and I draw a red clover next to the number. Q: Do you have any siblings, If so, how old? A book by Québec author Michel Tremblay that I had to read for school: Un ange cornu avec des ailes de tôle. Q: Who would you play in a movie about your life? I am a good tennis player. A video of my swing. Q:What is the most surprising thing in your golf bag?